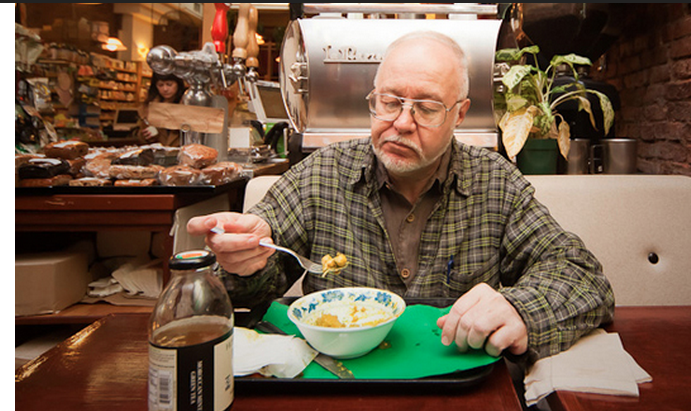 We all do it, multiple times a day, no matter where it may be or who with—we take a moment to enjoy our meals. In American culture the idea of family dinners have changed quite a bit since the 1950’s sitcoms and TV dinners. But when it comes to eating it is more then just nourishment, while a simple meal can tell you a lot about a person or society. But for photographer Miho Aikawa and so many others, myself included, she grew up with parents who insisted on consistent family dinners. Nevertheless, as an adult personal agendas change and traditions shift—especially when living in the city. So for Aikawa, this theme has become the basis for some of her most recent work, where she explores how an evening meal is evolving in New York City. Let’s take a look. Avina Christie – Avina, a 9-month-old having dinner with her mother, while having a Skype video call with her grandparents who live in Boston.